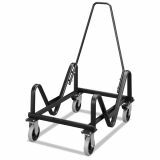 HON GuestStacker Cart, 21-3/8 x 35-1/2 x 37-7/8, Black - Update any gathering space with GuestStacker from HON. This smart alternative to plain folding chairs is molded to fit the body and features a heavy-duty steel frame. The solid construction endures busy schedules and frequent rearrangement. Chairs ship four to a carton, and stack six high on the floor or 28 high on their special cart. Warranted for users up to 300 lbs.